Gaze-based keyboards offer a flexible way for human-computer interaction in both disabled and able-bodied people. Besides their convenience, they still lead to error-prone human-computer interaction. Eye tracking devices may misinterpret user’s gaze resulting in typesetting errors, especially when operated in fast mode. As a potential remedy, we present a novel error detection system that aggregates the decision from two distinct subsystems, each one dealing with disparate data streams. The first subsystem operates on gaze-related measurements and exploits the eye-transition pattern to flag a typo. The second, is a brain-computer interface that utilizes a neural response, known as Error-Related Potentials (ErrPs), which is inherently generated whenever the subject observes an erroneous action. 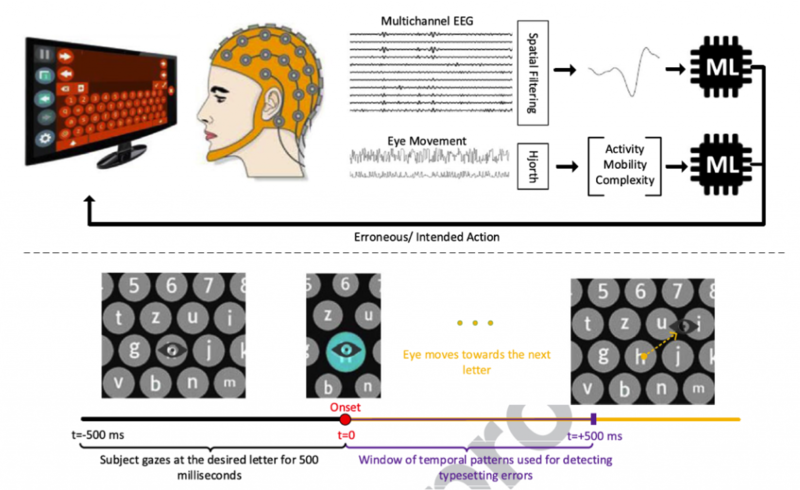 Based on the experimental data gathered from 10 participants under a spontaneous typesetting scenario, we first demonstrate that ErrP-based Brain Computer Interfaces can be indeed useful in the context of gaze-based typesetting, despite the putative contamination of EEG activity from the eye-movement artefact. Then, we show that the performance of this subsystem can be further improved by considering also the error detection from the gaze-related subsystem. Finally, the proposed bimodal error detection system is shown to significantly reduce the typesetting time in a gaze-based keyboard. Read NextVery happy to announce that our journal paper on using motor imagery BCIs in patients with neuromuscular disease has been accepted in the Journal of NeuroEngineering and Rehabilitation!